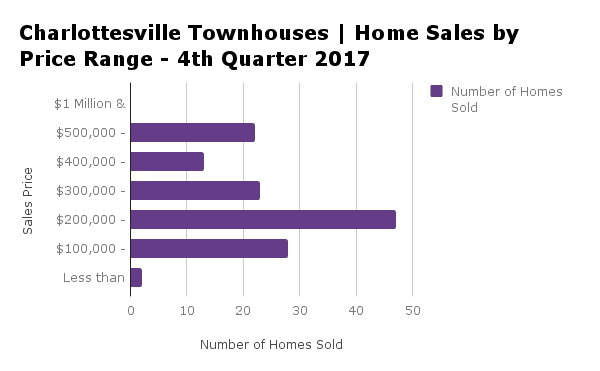 Charlottesville townhouseÂ sales decreasedÂ in the fourth quarter of 2017. A total of 135 townhomes sold in the 4th quarter of 2017 compared to 148 townhomes in the 3rd quarter of 2017. 57% ofÂ Charlottesville townhouseÂ sales in the fourth quarter of 2017 were in the below $300,000 price range. 1 foreclosure and 1Â short saleÂ sold this quarter.Â Distressed property sales made up 1.5% of the Charlottesville townhouse market in the 4th quarter of 2017. TheÂ Charlottesville townhouseÂ market is a sellerâ€™s market. Looking toÂ buy or sell a Charlottesville townhome?Â We Can Help! SELLING:Â Itâ€™s important that you hire aÂ Charlottesville Townhouse SpecialistÂ who knows the market. If you are considering selling your townhouse in Charlottesville and you would like to know the value in todayâ€™s market, you can find out atÂ Whatâ€™s My Charlottesville Townhouse WorthÂ orÂ give us a call at 434.882.1055 to schedule a FREE comparative market analysis tailored to your specific home selling needs. This report examines townhouse sales in Charlottesville and Albemarle County. For more information onÂ townhousesÂ for sale in Charlottesville Virginia, please call Allegra Williams, Realtor with Keller Williams Realty at 434.882.1055. Contact me today to get your Charlottesville townhome on the market or find your dream home in Charlottesville!